Our serialized Americana would hardly be complete without that classic rogue, the bank robber. 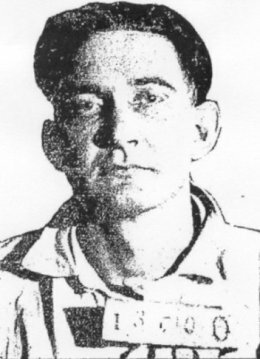 On this date in 1924, “chewing the frayed stump of a cigar,” holdup man Richard Birkes sauntered to the electric chair at the McAlester, Oklahoma state prison and rode the lightning for gunning down a teller in the course of a heist. “So long boys,” which he tried to accompany with a wave of the hand already strapped to the death-chair, were Birkes’ last words. Birkes was unquestionably part of the three-man team that had knocked over the Ketchum Bank the summer prior, laying poor Frank Pitts, Sr. in his grave. The robber’s potential “innocence” turned on the question of which miscreant actually put him there. This “non-triggerman” stuff is not necessarily legally or morally compelling in the best of circumstances, but right or wrong it was dispositive in this case: his accomplices both drew life terms. That executive’s thoughts ran to different plans. Alarmed at the rash of bank jobs by brazen outlaws like Birkes who could strike and then escape over county lines in their period Studebakers, twirling their villainous mustaches, said unmerciful Gov. Martin E. Trapp the next year created a statewide law enforcement agency, the Oklahoma State Bureau of Invesigation. This bureau’s effective intervention in the Sooner gangland scene (bank robberies fell … ) heralded a long and fruitful life that still continues to this day. They’re the people you’re gonna call when some local police pathologist gets caught systematically cooking forensic results to order for the state’s prosecutors.